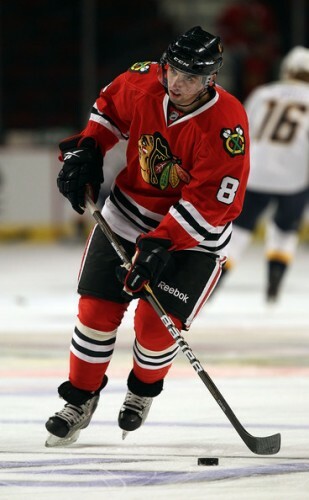 In a shocking move on Sunday morning, the Blackhawks have sent top prospect Nick Leddy to Rockford. Leddy ranked third on the team in blocked shots after Saturday night’s game behind only Duncan Keith and Nick Boynton, and has been seeing time on the Hawks second defensive pair. This move comes after Niklas Hjalmarsson returned from his two-game suspension on Saturday. It appears that Jassen Cullimore will stay in Chicago, at least until Brian Campbell is healthy. With Campbell out of the lineup, Leddy served as an effective secondary puck-moving defenseman. Cullimore, Boynton and John Scott are all more physical players, and both Cullimore and Scott have been embarrassed by their poor skating in the last week. Jordan Hendry, the other option on the blue line, isn’t very physical and doesn’t handle the puck well. Leddy will be back in Chicago soon. This move does not make much sense to the immediate needs for the Blackhawks on the ice, and Leddy’s confidence appeared to be improving with each game. I HOPE LEDDY COMES BACK HE IS FAST ON HIS SKATES, BEING PHYSICAL WILL COME WITH TIME !!! !